"This is as important a book on this subject as I recall ever having read." -- Huston Smith"Brilliant.... Schroeder's book demands the attention of anyone who wonders if God must be exiled from the modern, enlightened mind." -- David J. Wolpe, author of Why Faith Matters In his first book since 2002's acclaimed The Hidden Face of God, popular scientist Gerald Schroeder combines decades of scientific research and biblical study to present a groundbreaking new paradigm of how to understand God. 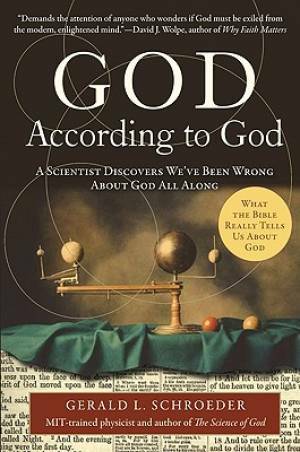 Readers of Jack Miles' God: A Biography, Francis Collins's The Language of God, and Richard Friedman's Who Wrote the Bible will find much to contemplate in God According to God. God According to God by Gerald L. Schroeder was published by HarperCollins in May 2010 and is our 59549th best seller. The ISBN for God According to God is 9780061710162. Be the first to review God According to God! Got a question? No problem! Just click here to ask us about God According to God.